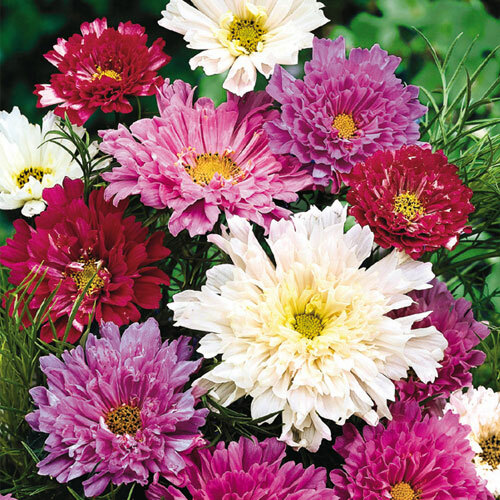 Double Click Cosmos | Gurney's Seed & Nursery Co. Huge, frilly double blooms in shades of red, pink and white top attractive 4-ft. lacy foliage. Direct sow after last frost and enjoy the cut and come again blooms from June to October. Perfect for bouquets and borders. FoliageVery finely cut lacy, green foliage. ColorRed, pink and white flowers. BloomsJune - October until first hard frost. Seed CountApproximately 30 seeds per packet. CommentsHuge frilly double blooms in shades of red, pink & white top attractive 4 foot lacy foliage, very easy to grow. Direct sow, after last frost and enjoy the cut-and-come again blooms from June to October. Perfect for bouquets and borders.